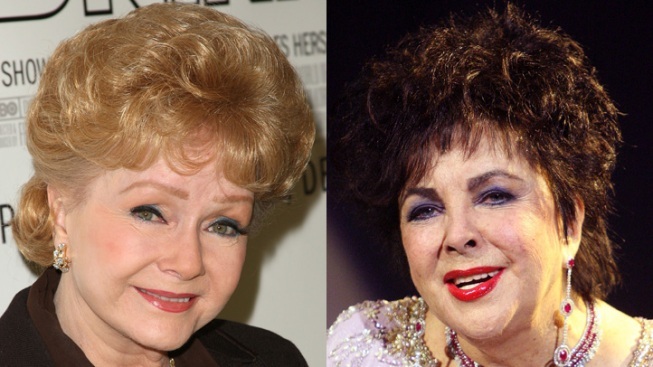 A split image of former rivals Debbie Reynolds and Elizabeth Taylor. They were once bitter rivals over a man, but Liz Taylor and Debbie Reynolds buried the hatchet long before Taylor's death on Wednesday. The pair spoke just two weeks ago, as Taylor lay in a hospital bed, and the subject was much more mundane than how Eddie Fisher came between them so many years ago. "I said, 'Getting old is really sh––,' " Reynolds told Access Hollywood of her final conversation with Taylor. "And she said, 'It certainly is. It certainly is, Debbie. This is really tough.' "
"God bless her, she's on to a better place," Reynolds, 78, said. "I'm happy that she's out of her pain, because she was in a lot of pain." The 1950s bombshells were forever linked by Fisher, who was married to Reynolds until 1958, when Fisher left her for Taylor. Fisher had been comforting Taylor following the loss of her third husband, Mike Todd, who died in a plane crash. Fisher, who had been Todd's best friend, became husband No. 4. The situation cemented Taylor's reputation as a femme fatale and Reynolds as the wholesome victim, the original Jennifer Aniston and Angelina Jolie. Years later, the two became friends again, and on Wednesday, Reynolds reflected on Taylor's "long productive career." "She was the most glamorous and sexual star of our generation," Reynolds, 78, said. "No one else could equal Elizabeth's beauty and sexuality. Women liked her and men adored her, and her love for her children is enduring." Actress Carrie Fisher, who was a child when her parents split and then became Taylor's step-daughter, said she learned to love Taylor. "If my father had to divorce my mother for anyone - I'm so grateful that it was Elizabeth," Fisher said. "A woman who rarely did things in half measure." While making an appearance on "Piers Morgan Tonight" last night, Fisher recounted a bizarre double date she went on with Taylor, Michael Jackson, and Shirely MacLaine. Selected Reading: People, Access Hollywood, contactmusic.com.